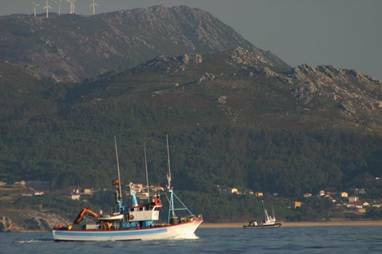 We left Camarinas at a lunchtime and headed south rounding Cabo Finisterre, a route known locally as the Costa del Morte – ‘The Coast of Death! This is because in bad weather it is susceptible to large waves and has numerous unmarked off lying rocks lurking dangerously just beneath the surface. Fortunately for us it was, as usual, dead calm with no wind. 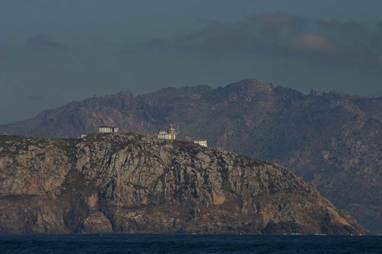 Apart from the odd light house the Spanish don’t believe in any navigation marks, so all the rocks are totally unmarked. 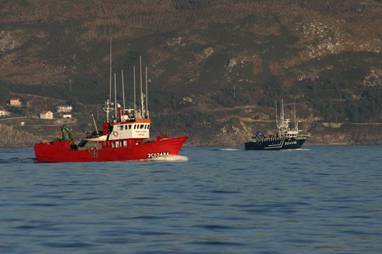 To add to the fun the area is swarming with fishing boats and tiny pot markers, which are impossible to see until virtually too late. Navigating this coast is relatively easy now with GPS and plotters, but one can see why it had such a bad reputation. 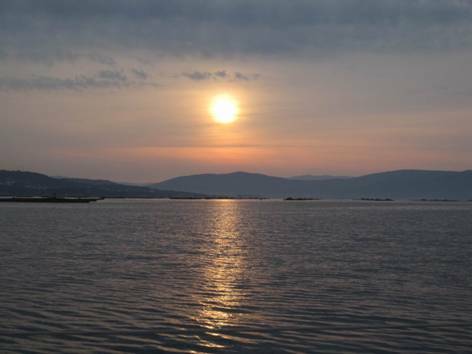 However despite the danger area has wonderful rugged scenery and many beautiful Rias with lovely anchorages. 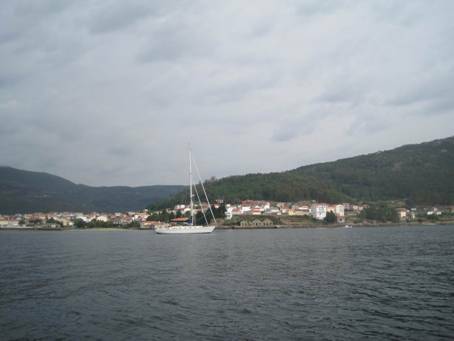 We arrived at about 8.30pm and anchored off the town of Muros in the Ria de Muros. We are on the westernmost tip of Spain and of mainland Europe, which is much further west than the UK, but as their clocks are an hour ahead it doesn’t get light until nearly 8am and doesn’t get dark until about 9.30pm, hence the late starts, which Mary thinks are great! The Spanish are famed for staying up really late but could this be because their clocks are so out of synch with the daylight? We dinghied ashore to Muros in the morning and wandered around the old cobbled streets through narrow alleyways, it was very pretty and a lot posher than Camarinas with tourism as well as fishing benefitting the economy. We then had a short motor of about an hour over to the other side of the Ria and berthed in the marina in Portosin where Alan changed the oil in the engine and Mary did more washing – afternoon fun for all! Cobo Finisterre looking menacing, even though it was flat calm! The opening shot from The Perfect Storm? There’s fishing boats everywhere!